Cate Blanchett, Sally Hawkins, Bobby Cannavale and Alec Baldwin star in the dramedy written and directed by Woody Allen. 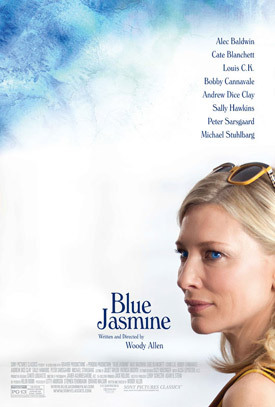 Watch the Blue Jasmine movie trailer below. After everything in her life falls to pieces, including her marriage to wealthy businessman Hal (Baldwin), elegant New York socialite Jasmine (Blanchett) moves into her sister Ginger’s modest apartment in San Francisco to try to pull herself back together again. Running Time: 1 hr. 38 min. MPAA Rating: (PG-13) for mature thematic material, language and sexual content. After everything in her life falls to pieces, including her marriage to wealthy businessman Hal (Alec Baldwin), elegant New York socialite Jasmine (Cate Blanchett) moves into her sister Ginger’s (Sally Hawkins) modest apartment in San Francisco to try to pull herself back together again.